$100 $100 bonus after spending $1,500 in purchase transactions within 90 days of account opening. 5X Earn 5 points on gas purchases at the pump. Fuel purchases for airplanes and boats do not receive cash back rewards. 3X Earn 3 points on supermarket purchases. 1X Earn 1 point on all other purchases. 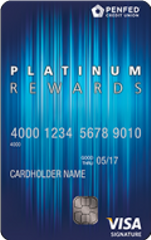 Our take: The PenFed Platinum Rewards card offers generous rewards and ample benefits for an appealing price, but its travel booking fees drag down the card’s appeal.